This may be the most dynamic pairing since Lennon and McCartney. Or maybe Ben and Jerry? What synergies do you get when you combine access to Shutterstock’s collection of high-quality content and editing capabilities with Watson’s power of artificial intelligence (AI)? You get an engine to create the kind of assets that will uniquely resonate with your target customer. Powered by AI, Watson Content Hub was built to manage large repositories of content. The system understands and learns over time about the data in your company’s content management system. Get recommendations for new content as you start your search and then easily find the content in your repository when you need it. When new content is added into Watson Content Hub, AI in the platform instantly analyzes metadata and automatically proposes tags from thousands of concepts, objects, colors, ages, genders, etc. 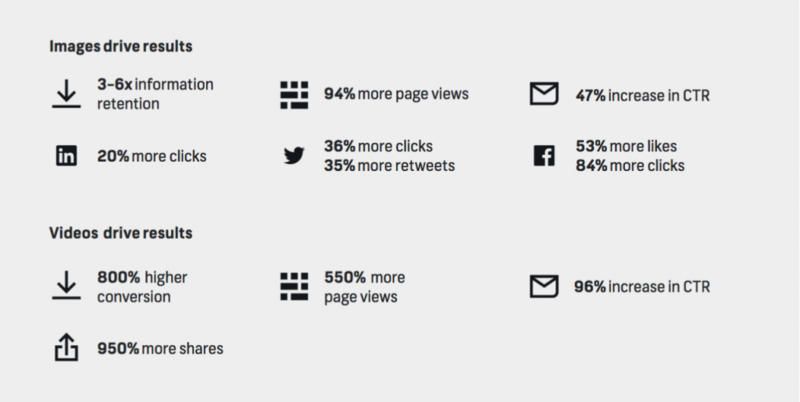 You’ve probably purchased content to supplement what you have in-house. Your content team probably spends hours hunting for just the right image to communicate your message. With a library of quality content from Shutterstock, you’ve got choices at your fingertips. And with Watson Content Hub you can quickly narrow down your options to find just the right piece. As a result, you can quickly discover the right visuals and music scores. 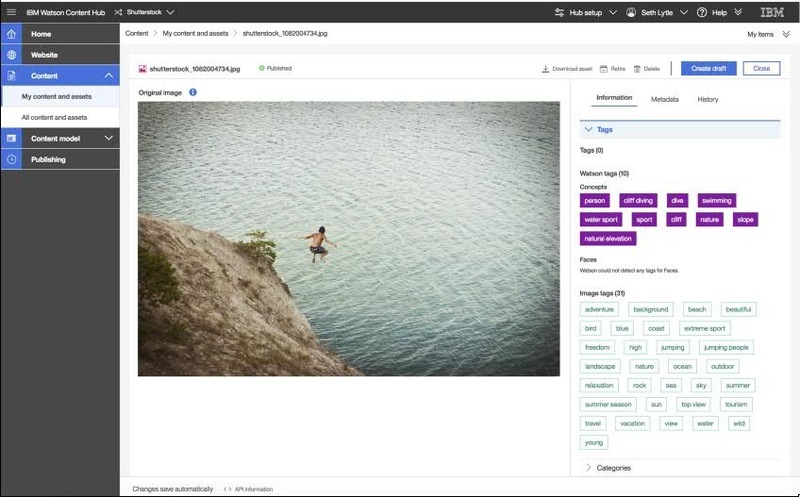 In addition to the content, Watson Content Hub also delivers customers fast access to Shutterstock Editor. 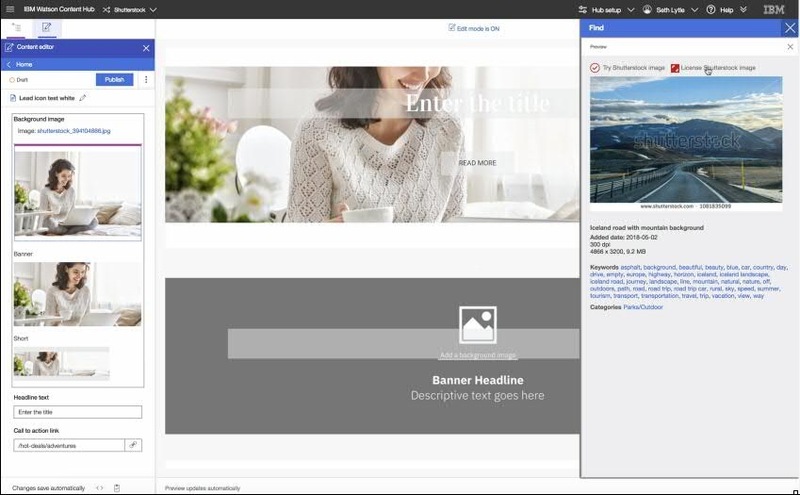 Now after finding images, teams can customize them to create a professional looking campaign. This solution includes commonly used tools such as preset sizes for popular social media platforms and emails and the ability to add filters, text and shapes. It even enables users to upload their own logos or product images to supplement designs. It’s this paring of AI with great content and powerful editor tools that lets teams quickly launch great looking campaigns that not only tell the story of your brand but build awareness and generate leads. We look forward to seeing the powerful campaigns Watson Content Hub users create with Shutterstock’s content and editing tool.